Furniture is expensive, no doubt about it. In spite of the expense, some of the newer furniture is much less well made than older pieces. Whether you are just starting out; wanting to freshen up your own older items; or furnishing a second home, furniture buying can make a big dent in your budget. But there are ways to save – consider used furniture. Ways to save on furniture. Garage sale and thrift store furniture bargains abound. While most folks consider wood and metal used furniture to be quite restorable, many turn their noses up at re-using fabric covered items. It is no wonder, as there are quite reasonable concerns about what might be lurking within. However, there are ways to safely and beautifully reuse/restore items such as beds, sofas, chairs and decorative pillows. I recently bought a daybed, with a pop-up trundle and 2 mattresses for $30 (note that buying this set new would cost upwards of $300) and just completed my first re-upholstery job on a reclining wing back chair that came with our vacation condo. A new reclining wing back chair of lesser quality would have set me back more than $700. I was able to buy the upholstery fabric to redo it for just $50. You can also find older, quality items at used furniture stores. I found some nice end tables for our condo. Family hand me downs and heirloom furniture can also save you money. Our home furnishings include many cherished family heirlooms, such as an iron bed my folks bought at a sale, or the hand carved bed frame purchased by my great-grandfather. How to make used furniture usable. Often older cloth furniture retains the smells from its prior life. No one wants smelly goods! Furniture with cloth components can also harbor things you don’t want to even think about. Wood and metal can deteriorate or just plain go out of style. My daybed mattresses were previously used by a young girl, in her growing up bedroom, then stored by the parents for years. They smelled musty and perfumy. To solve the issue, I aired them on the porch and in the sunshine for about 2 months. I confess, that I also sprayed them with Fabreeze – just as an added measure. Sometimes older cloth furniture has dust mites and flakes of someone elses hair and skin in it and maybe even little living things. Just the thought of it turns your stomach, right? To solve those potential issues on the mattresses, I let them sit out on several sub-zero days and nights, to kill any living bugs. I used several boxes of baking soda to help sanitize and deodorize them as well. thoroughly vacuuming it off and re-applying several times. I used a shop vac, but any powerful vacuum would work. To be extra cautious, after doing all of the above, I encased each mattress within a zippered vinyl mattress cover. Dealing with smaller cloth items. Decorative pillows and smaller cloth items can be spot cleaned, then tumbled in the clothes dryer to kill germs and freshen them. Worn, torn and dirty upholstery (or just plain ugly fabric) can be taken off of chairs, sofas, footstools and etc and replaced with new. My condo wing back recliner was my first attempt at something more complex than recovering the bottoms of dining room chairs. Although upholstery material can be very expensive (think $25+ a yard), you can find it on sale. I got mine for around $7 a yard. Six yards covered my chair. If you are going to attempt do it yourself upholstery, I recommend getting a tack puller and a staple gun that will be fairly easy shoot staples with and that will handle longer, thinner upholstery staples. I used a standard hardware store staple gun that shot thick 3/8″ staples and was very hard to use. My chair often required multiple layers to be stapled together and I had to pound the staples in with a tack hammer to get them to stay. I know that having someone redo an upholstered piece is expensive, but I now understand why – there is a lot of manual and time-consuming work involved. I watched You Tube videos several times before attempting mine. This series was particularly good. https://www.youtube.com/watch?v=OOM7FTJfeG8 I spent 5 10 – 12 hour days redoing one chair! Since I’m retired, my time isn’t worth money. If you are still employed, think about the opportunity cost of spending those hours to determine if it would be more cost-effective to have someone else do the work! Spiffing up the wood and metal. If you are dealing with a wood heirloom family piece, or a valuable antique, you most likely don’t want to lose the original finish, as that can destroy part of the value of your item. Older pieces may have different types of finishes on them too, so you need to figure out what is on there to know what you can put on top of it. Some of the finishes are shellac, lacquer, varnish, and Danish oil. I found a couple of products that are fairly easy to use right over the old surface. On Mom’s WWII era Lane cedar chest, I used a product called Howard’s Restore-a-Finish to cover the multitude of chips and scratches from the used furniture I wanted to keep. There another product called Krammer’s Best Antique Improver that also works well. I found both at area antique malls. For less valuable used furniture, you might want to strip, sand and refinish them. Sometimes you might need to replace or repair parts and pieces of the furniture. The toy ice cream table and chairs from my Mom’s childhood have an iron frame, which I stripped and spray painted. It had way too many coats of paint on it to ever be pretty again otherwise. The wood table top and chair bottoms were rotten, so I cut new pieces from pine and stained and finished them. I hate waste, but I also hate the way our vacation condo dining table looks. It is a sturdy wood table with a tabletop finish that withstands the abuse by multiple large parties of renter dining each season. 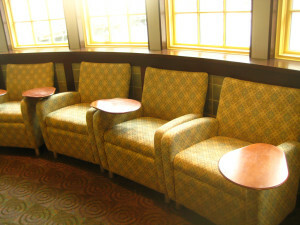 Several years ago, I re-covered the chair seats. To update the look more, I painted the engraved emblem on the top of each chair flat black and will be painting the table (except the top) with the same color next time I am there. Changing out the hardware, painting or antiquing the surface or adding decorative touches might be ways you could update the look of your old furniture pieces or cabinets. So, if you have the time and the patience, you can safely and economically reuse furniture of almost any type. Have you renewed used furniture?